This magnificent park in the north of Moscow features more than 250 Soviet-era palaces and pavilions, arches and fountains, a Vostok rocket and Soviet aircraft. 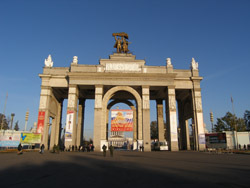 The Soviet name VDNKh is an acronym meaning "the Exhibition of the Achievements of the National Economy". The area of this complex is greater than that of the Principality of Monaco; it is like a fantastic town with its own avenues, squares and gardens. The park was built during Stalin's time. Construction started in the 1930s, and in 1954 the exhibition complex acquired the architectural works we see today. Created to be a showcase for the achievements of the Soviet empire, VDNKh had pavilions dedicated to a particular industry or a field (engineering, space, atomic energy, the people's education, Soviet culture and many others). 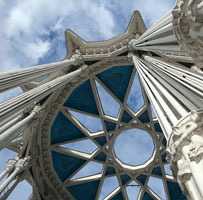 There are also pavilions representing the various Soviet Republics, with each boasting a unique architectural design. 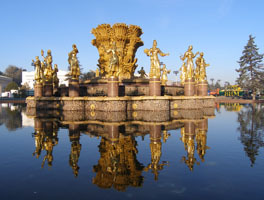 Walking around the people's friendship fountain, visitors could have an imaginary trip around the whole Soviet Empire. One of the most beautiful pavilions is that belonging to Uzbekistan, distinguished by the airy elegance of its eastern architecture. Not far from the park entrance is the famous Soviet sculpture by Vera Muhina – Worker and Collective Farm Girl. The gigantic figures of man and woman holding hammer and sickle became a Soviet symbol. If you stay in Moscow for at least a few days, go and explore VDNKh with your Moscow tour guide.